It was a classic battle between two of the best young runners in the Central Coast Section. 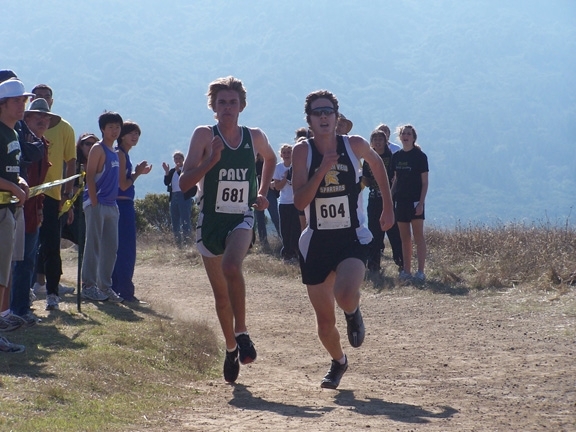 Philip MacQuitty of Palo Alto edged Garrett Rowe of Mountain View in a photo finish as the sophomores raced in the El Camino Division finals at the Crystal Springs Course on Wednesday. Both runners were credited with times of 15 minutes, 12 seconds on the 2.95-mile course. In the team competition, Palo Alto (48) edged Mountain View and Santa Clara, who tied for second with a score of 53. The 15:12 was the seventh-fastest for a sophomore in the 36-year history of the course. "It was a great race," said Lynbrook Coach Hank Lawson, who saw the runners coming down the stretch. "In the last 50 yards, Rowe would take the lead, then MacQuitty would surge forward to catch up. You could see a look in MacQuitty's eye that he didn't want to lose. He made one final surge at the tape to barely edge Rowe." The runners will get another shot at each other in the CCS Division II race at Crystal Springs on Nov. 10. In the girls races, Gunn freshman Jackie Evans continued her impressive season by winning the El Camino Division race with a time of 18:09, beating teammate Allegra Mayer by 29 seconds. Gunn's team time of 1:35.11 was the eighth best in Crystal Springs history. The Los Gatos boys and girls teams won the De Anza division races. Michael Johnson (15:31) took the boys race, with Kaela Townsend (18:29) winning the girls event.